Architects have been at the forefront of the British metalcore scene for a few years now, and after a few stumbling blocks along the way (The Here And Now) their fifth album Lost Forever // Lost Together sees the Sussex band finally find their feet and serve up a heavy record that goes straight for the jugular and rarely releases its hold. Lost Forever // Lost Together is a beast of a release that constantly bristles with an angry and passionate intensity across its 44 minute length and only eases up for a few brief respites. Opener Gravedigger dives straight in after a subtle intro and sets the bar remarkably high as vocalist Sam Carter yells out ‘You are the reason we are bitter and then some’ followed by a trademark ‘blergh!’ and a heavy and technical breakdown. Architects hit the ground running on the opener, and set a pace they somehow manage to keep up through immensely impressive instrumentals and the excellent inflamed delivery of Carter, who excels throughout. He manages to capture and convey anger brilliantly, and his vocals roar and soar in trademark fashion, howling on lead single Naysayer, which is one of the standout tracks. At times his cleaner vocals sound a little strained, and for the most part they take a back seat, which does suit the records darker tone. Lyrically, there’s a departure from the politics of Daybreaker and instead Carter and guitarist Tom Searle focus more on religion, amongst other subjects. Fourth track The Devil Is Near addresses the recent Japanese dolphin slaughter (‘This is where tragedy is bought and sold / It seems their pain is worth its weight in gold’) whilst the massive Colony Collapse alludes to Chernobyl . There’s a message behind every song on Lost Forever // Lost Together and each is well-penned and conveyed with honest emotion and passion, in every aspect of the band’s music. On tracks like the aforementioned Naysayer and its bouncing, crunching chorus the band have rarely sounded better and the song is absolutely huge, showcasing Architects’ at their jaw-dropping best. The song drops off only to explode back, and Architects make a habit of doing exactly the right thing at the right time, taking their foot off the gas for the more humbling moments and slamming it back down for the more dynamic. From a songwriting perspective Lost Forever // Lost Together is a behemoth, expertly crafted and sublimely executed. Frederick Nordström’s production is polished, and signing with Epitaph Records seems to have only bolstered the bands confidence, and with this release I’d expect the band to make strides similar to label mates letlive. and Bring Me The Horizon. Lost Forever // Lost Together is as technical as it is heavy, and drummer Dan Searle gives one of the best performances you’re likely to hear this year, particularly on the massive C.A.N.C.E.R. The track contains elements of djent, as does fifth track Dead Man Talking, and these more experimental segments are pulled off brilliantly, as is the instrumental filler Red Hypergiant, which manages to sound as large as its namesake and features a brief and inspirational Carl Sagan sample. The final few tracks on Lost Forever // Lost Together slow things down a little, if only slightly. The questioning Castles In The Air brings a bit more melody to proceedings in its final minutes, whilst following track Youth Is Wasted On The Young features a suitably haunting and mellowing vocal feature from Murray Macleod of The Xcerts. Eighth entry Colony Collapse was probably my favourite selection from the record, and it marks one of the bands more adventurous songs, encompassing a number of tones and expressing each of the them with an electric attention to detail, bursting into life before sitting back as Carter cries ‘Give us the rope and we’ll tie our own noose’. The song features some of the records best guitar work, providing sparks of melody amongst the controlled chaos of some of the songs more emphatic moments. Lost Forever // Lost Together closes with the mammoth The Distant Blue, and the finale is suitably epic, as you’ve come to expect from Architects. After a climbing intro the song explodes into chugging djent and ferocious vocals, before undergoing a change at the halfway point that is nothing short of incredible, unfolding and rising majestically. Architects have a tendency to bow out in style, and you’d have to go back to Hollow Crown to find a song by the band with as many goosebump inducing moments. Speaking of Hollow Crown, I tend to find that my experience of Architects’ albums is often marred by how high I regard their third album, and I go into any new releases with the expectation that it won’t beat it, which is an odd approach. It’s more of a testament to how good Hollow Crown actually is than a criticism of current work, and for me Lost Forever // Lost Together doesn’t quite top it, although it is the bands best work since, which is also high praise considering the likes of Daybreaker. If you’re a fan of the bands earlier work you’ll appreciate the darker side to tracks like Red Hypergiant and C.A.N.C.E.R, reminiscent of Ruin and Nightmares, and it’s good to see Architects take influence from their earlier material, bringing an aspect that recent releases lacked. However, as much as they try to bring some variety to their music, occasionally Lost Forever // Lost Together falls into the genre trap of sometimes sounding too similar, with a few tracks chugging along and not really doing enough to set themselves apart. It’s expected from music of this nature, but dropping some of the softer songs doesn’t always work in Architects’ favour. That being said, the eleven tracks that the record contains are metalcore of the highest quality, and I wholly expect it to remain one of the years better records come December. 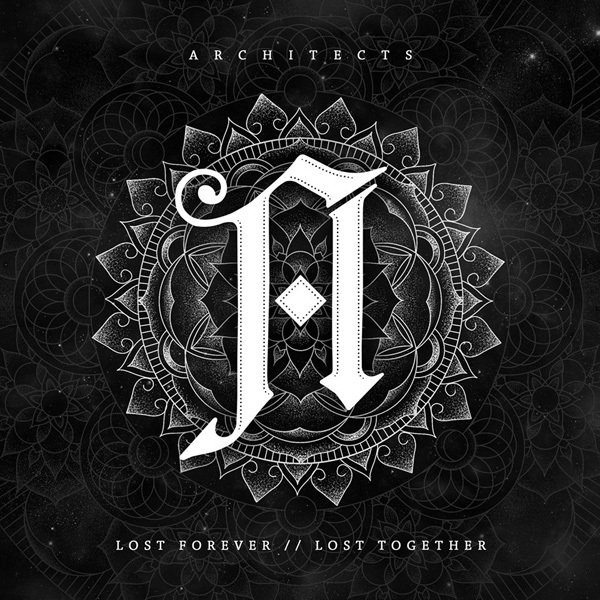 With their fifth studio album Architects have shown that they are currently the best at what they do, and Lost Forever // Lost Together is the record they’ve been working towards, being of enormous scope and stunning intensity. If they aren’t already, this will be the release that really puts them on the map the world over, and it’s a release the band can be immensely proud of.